After the exploits of the London Irish Rifles at Loos and on the Somme during the previous two years, it is perhaps surprising to learn that 1917 would see the highest death toll for the Regiment during either World War. Over 350 London Irish Riflemen would be killed in action during the year. The 1st Battalion (1/18th Battalion, London Regiment) spent the first nine months of 1917 in the Ypres salient before moving to Cambrai at the end of November area to join the bitterly fought defensive battle at Bourlon Wood. Meanwhile, along with the rest of 180th Infantry Brigade in 60th (London) Division, the 2nd Battalion (2/18th Battalion) had stayed on the Salonika front until June 1917, when the whole division would move across to Egypt to join General Allenby’s Egyptian Expeditionary Force (EEF). Since November 1916, the battalion had been commanded by Lt Colonel Arthur Norton and he would continue in that role right up to the time of its disbandment in July 1918. Before taking part in the desert campaign, it had been widely noted that the 60th Division had made it right through to the autumn of 1917 without having been engaged in offensive operations or involved in a major battle since it was formed a few weeks after the outbreak of war. Things were certainly about to change. The early part of the advance in Palestine during late October/early November 1917 was dominated by wide ranging infantry/cavalry assaults that allowed Allenby’s forces to outflank the strongly held Ottoman Turkish positions around Gaza and which led to their hasty retreat northwards. The 60th Division would successfully combine with some remarkable cavalry actions at Sheria on 8th November and the division would receive their first battle honours “Gaza” and “El Mughar” for their part in these battles, which had rolled up the whole of the Turkish defensive positions from Beersheba to Gaza. An advance towards Jerusalem by the EEF could now take place and before the end of the year, the 2/18th Battalion would take part in three further engagements close to the Holy City, and which culminated in a disastrous assault on the hilltop position of Kherbet Adasseh. Nebi Samwil. Following their part in the Battle of Sheria, the 60th Division had fifteen days at rest before the advance northwards began again in earnest, when they could end their time on ”the flat” and begin the climb through the hills towards Jerusalem. It was noted at the time by Corporal Ernest May that there was, ”a certain magic about the Holy City and surely we all felt it.” About 5 miles north-west of Jerusalem was a high point, Nebi Samwil, which was reputed to be the site of the tomb of the Prophet Samuel and, from this position, it was also said that in 1192 it was where King Richard would “refuse” to look down on the city that he knew he could not capture. In 1917, it was the site of a prominently located mosque and most importantly the position overlooked the road that ran north from Jerusalem to Nablus. In the face of a concerted assault by Turkish forces on the afternoon of 29th November, the battalions of 180th Brigade would be engaged in successful defensive actions at Nebi Samwil that continued late into the evening. Due to concerted Turkish artillery fire at the outset of the assault, the great mosque at Nebi Samwil would be brought crashing to the ground. Liver and Heart Redoubts. For the next week, the battalion would again rest before, on the evening of 7th/8th December, they started moving up to their positions in preparation for the attack on Jerusalem. The two defensive strongpoints of Liver and Heart Redoubts were vitally important in enabling the capture of Jerusalem and their capture was entrusted to 2/18th Battalion. After capturing Liver Redoubt at 0545 hours, they only took a further 30 minutes to capture the second objective. The three other infantry battalions of 180th Brigade were all involved in assaults to the right of 2/18th Battalion and the divisional actions that day would be completed by a bayonet charge. These successful assaults would cause all the Turkish forces in the area to hastily retire from their defensive positions and led to an immediate withdrawal from Jerusalem. 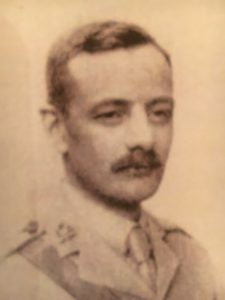 One of the five 5 London Irishmen killed on 8th December was the Adjutant, Lt Thomas Willis, and it was noted that on the night before his death, Lt Willis had told the Commanding Officer, that he “would never see Jerusalem”, a soldier’s premonition that is not always fulfilled but was certainly true in this case. The following morning, on 9th December, the 180th Brigade Commander, Brigadier CF Watson would accept the surrender of Jerusalem from its Mayor near the Jaffa Gate. In stark contrast to this glorious event, the war diaries of 2/18th Battalion noted that the Battalion HQ was established that night “in an old tomb”. Two days later, General Allenby would make his formal entry into the city, one that has historic resonance to this day. In the course of five weeks, the battalion had passed from the great heat and water scarcity of the desert to days and nights of continuous rain and it had now become bitterly cold. The area north of Jerusalem was a nightmare of rocky hills and no frontline was obvious. Some of the high points were held by the Turks, others not. One of the highest hills, midway between each Army’s position and thought to contain an enemy observation post, was one called Kherbet Adasseh. On 18th December, a failed attempt had been made by the battalion to take Kherbet Adasseh before, on the night of 22nd/23rd December, the 2/18th Battalion was again ordered to take and hold the position. The following hours were a tale of almost complete disaster for the battalion. Only one out of 14 officers would return and the battalion strength of nearly 700 would be reduced to 130. According to the CWGC, 54 London Irishmen, killed on 23rd December 1917, are buried or named in Memorial at their cemetery in Jerusalem. It was a truly catastrophic day for the battalion and a wooden Memorial Cross would be erected by the Battalion Pioneer Sergeant on the exact spot of the disaster. It later emerged that two fresh Turkish divisions had recently arrived from Anatolia in preparation for an attempt to retake Jerusalem and it was these that the 2/18th Battalion had unexpectedly crashed into on the morning of 23rd December. A further unfortunate additional coda to the events at Kherbet Adasseh was that, when Battalion Chaplain Hickey helped to collect bodies a week later, he had noted that “practically every corpse had been stripped naked” and later it was found that some of Turkish dead were found “wearing uniforms and clothing taken from men of the London Irish.” A most regrettable outcome. The year had ended disastrously for the London Irish Rifles but they were now able to spend a number of weeks at peace and were able to gain reinforcements, both from new sources and men returning from hospital. During the spring of 1918, the 180th Brigade would join with the rest of 60th Division in taking part in raids into Transjordan and in early May were part of a thwarted second major assault across the Jordan River towards Amman. This would prove to be 2/18th Battalion’s final offensive action of the war as in July 1918, they would be formally disbanded with most of their men being posted to the Leinster Regiment, the Royal Irish Regiment and the Royal Irish Fusiliers. The battalion’s last war diary entry is dated 7th July 1918. As we reach the 100th anniversary of the events described here, we continue to treasure the memory of the men of the 2/18th Battalion. Photos courtesy of the Imperial War Museum. ‘First World War letters of George Herbert Whyte’, Jenny Cuff.